Alright, I have to vent and go on a diatribe as its been awhile. 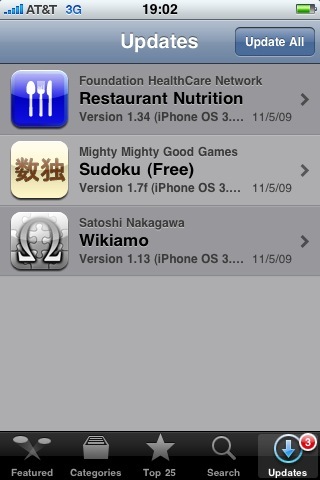 I was in the process of updating my iPhone and was greeted with these updates. 1.34? 1.7f? Why does Apple even bother showing the version number. I don’t even know what version of the software was previously installed. As a user, I only really care if there’s an update and what is included in that update. That’s it. The way software engineers treat version numbers is sad. Since the inception of software, we haven’t been able to come up with a reasonable versioning scheme that can be shared across technologies. Even worse, versions really mean nothing. On top of that, we confuse marketing version numbers with internal software version numbers. Here are some examples of what I’ve come across. Let’s start with Java. 1.0.3, 1.1.2, 1.4.2, 1.5.0, 1.6.0? Why both with the “1” in the version number? Next up we have is Windows… 3.1, 2000, XP, ME and 7. Awesome. I remember when Netscape magically went from version 4 to 6. You know, we didn’t really need a version 5 because IE was already at version 6. We can’t let our competitors out version us. In Linux… 2.3, 2.4.0, 2.6.8, 2.6.8.1… it’s cool when you can start adding version segments. Linux also seems to suffer the Java problem where the first digit is meaningless… maybe Linus’ favorite number is 2. On the bright side, the second segment in the version number at least signifies whether the code is considered stable or not. I’ll give bonus points to Linux for that. SmallEiffel… -0.87, -0.79, -0.74… nice… software versions that start on the negative scale and apparently count down to zero. In areas where modules exist and there’s a goal of reusable components (think OSGi and Maven), there’s a standard version scheme with a recommended policy on how to handle version changes. The only problem is that not everyone follows the scheme given their experience where version numbers mean nothing. It also doesn’t help that version schemes may be different amongst similar component technologies. In the end, there really needs to be two types of versions, one for the marketing department and one for the development department. Confusing the two types is bad. It’s good to see that I’m not the only one that feels like this, there’s some funny commentary by Jeff Atwood on versioning. Shame on us in the software industry for letting this crap continue.